How robust is the model to outliers? Could the model be made more robust? Which points will have a high leverage? What are good starting values for the fitting algorithm? Thorough answers to these questions and many more are included, as well as worked examples and selected problems for the reader. Discussions on the use of MLP models with spatial and spectral data are also included. Further treatment of highly important principal aspects of the MLP are provided, such as the robustness of the model in the event of outlying or atypical data; the influence and sensitivity curves of the MLP; why the MLP is a fairly robust model; and modifications to make the MLP more robust. The author also provides clarification of several misconceptions that are prevalent in existing neural network literature. Throughout the book, the MLP model is extended in several directions to show that a statistical modeling approach can make valuable contributions, and further exploration for fitting MLP models is made possible via the R and S-PLUS® codes that are available on the book's related Web site. 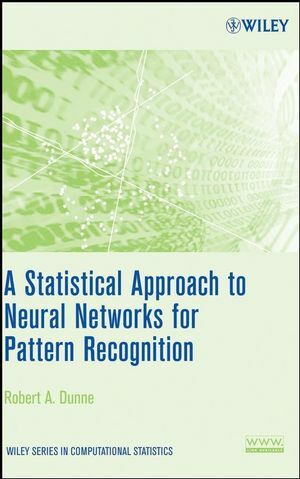 A Statistical Approach to Neural Networks for Pattern Recognition successfully connects logistic regression and linear discriminant analysis, thus making it a critical reference and self-study guide for students and professionals alike in the fields of mathematics, statistics, computer science, and electrical engineering. Robert A. Dunne, PhD, is Research Scientist in the Mathematical and Information Sciences Division of the Commonwealth Scientific and Industrial Research Organization (CSIRO) in North Ryde, Australia. Dr. Dunne received his PhD from Murdoch University, and his research interests include remote sensing and bioinformatics. 2. The Multi-Layer Perception Model. 4. Activation and Penalty Functions. 5. Model Fitting and Evaluation. 7. Incorporating Spatial Information into an MLP Classifier. 8. Influence Curves for the Multi-Layer Perceptron Classifier. 9. The Sensitivity Curves of the MLP Classifier. 10. A Robust Fitting Procedure for MLP Models. Appendix B. Maximum Values of the Influence Curve.